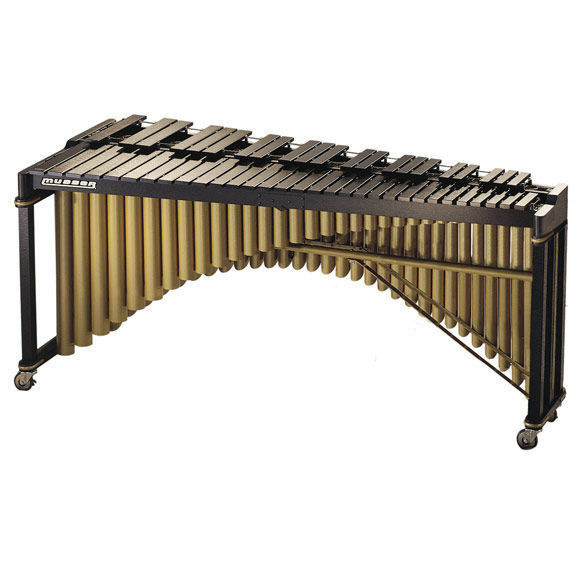 The versatility of the Classic Grand Marimba allows the percussionist to perform in any environment and features wide graduated Kelon Bars that deliver superb tone that is highly resistant to changes in temperature and humidity. This M300 model is a 4.3 Octave version (range A2 - C7) and is adapable to either field pit or orchestra stage. This model features Arched and Mitered Gold powder coated aluminum resonators and a Black Plextone frame that is NOT height adjustable. Shallow drop cover and mallets are included. Durable, and built to last! Our school has 2 marimbas, a musser m365, and and an m300. We have had the m300 since 1996! And, through all these years of general use, and the adventures of the marching seasons, this marimba has stood the test of time. But the instrument has had better days; a parent welded a frame for the instrument, and painted the resonators, which alters the pitch of the marimba. Although, if you are going to buy one, please use it only for the concert season, because pretty instruments such as this are, well, too pretty to ruin! Wondrous, wondrous instrument. Musser is the Steinway of marimbas! If you are looking for a wonderful sounding marimba for not a ton of money, I recommend buying it. For your own sake. do not buy this instrument. our school has 3 of them. all of them sound like crap. and they are poorly built. nothing like described in description. tons of better marimbas like Adams 4.3 concert padouk. or even the yamaha 4.3. this is an awful marimba.